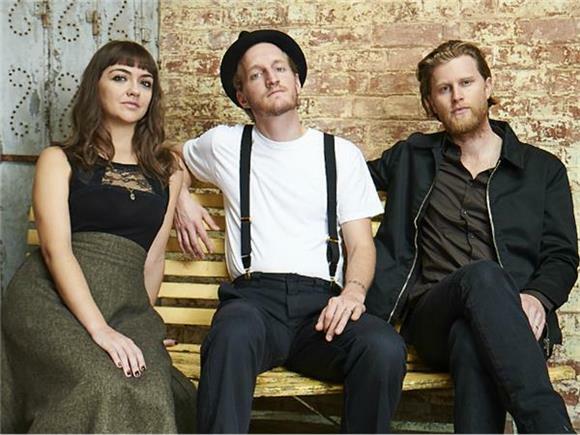 For those of you who haven't had the chance to watch The Lumineers' intricate music video trilogy for "Cleopatra," "Angela," and "Sleep on the Floor," it's a definite must. But for those of you who have, did you notice any similarities? A storyline even? Directed by Isaac Ravishankara, the videos follow a jumbled timeline of a troubled woman. A first glance at "Cleopatra" will probably find you putting a question mark over why the audience would seem to care for an elderly woman working as a taxi driver. When "Angela" was released four months ago you probably recognized scenes and lyrics. But by the time "Sleep on the Floor" rolled around a few weeks ago, everything began to make sense. Maybe you can't exactly place your finger on why there seems to be a supernatural phenomena in each video or why silent, long car rides happen to be the main focus. But if you watch closely, you'll discover that there's a hidden meaning within all of it. And we're here to show you. The Lumineers were clever enough to work backwards from the storyline. Why? It's all about the anticipation. Of course it was confusing but it was a great marketing tactic that garnered the attention of many to ask themselves "who is Cleopatra?". The storyline actually begins with "Sleep on the Floor," their most recent and final addition to the trilogy. The video shows a young couple after a funeral. We find out it's the girl's father who passed away, given the lyrics "Forget what Father Brennan said / We were not born in sin." The boy then asks her to leave town with him. Here is where we see her split away from her own body, a concept that the three videos utilized in a way of representing a "what if" scenario. We then see her alternate body escape with the boy, traveling and living out of their black Volvo in what seems to be a teenage fantasy. It only made sense that they eventually got married. But in the end, the video shows the girl lying on the floor of the home the video first opened up with, telling us that though her heart wanted to leave, her head told her to stay. Remember the wave tattoo the girl got in "Sleep on the Floor"? The same tattoo is shown on the woman in "Angela" as the video depicts a continued storyline from the same girl years later. We can see that she doesn't leave with the boy in her younger years as the video shows that she is pregnant and sleeping next to someone who would assumedly be her husband. The out of body experience returns as the woman splits from her body once more, her head telling her to go back to bed but her heart saying something differently. She aimlessly drives around showing how her internal conflicts gnaw at her conscience and that she doesn't have true feelings towards her current husband. Eventually she ventures to a motel where she seems to find happiness in her solidarity. Reviewing "Cleopatra" once more, we see that the beginning of the trilogy was the final ending for the storyline. Fast forward 30 to 40 years and we see the same woman working as a taxi driver. She drives around picking up strangers and observing them as they come and go. Appearances of the young couple in "Sleep on the Floor" and the pregnant woman all enter the cab showing that although these aren't literal, they play a metaphorical role in how the woman viewed her decisions in the past. The old woman then picks up what can only be her son and in a quick transition, she is suddenly happy and joyful as they share a simple meal of burger and fries during a warm sunset. The video finishes off with her dropping her son off at her husband's home (the one in "Angela"), with a final out of body experience. Looking back, she sees herself embrace her ex-husband and enter the home, something that could've been achieved if whatever had happened between them did not leave them broken apart. Instead, her real body remains rooted by her taxi cab as her ex-husband gives her a solemn look before shutting the door. Whoa. The Lumineers clearly thought this out pretty well. So what's their message? Based on the woman's "splittage" from her own body and the actions/events that follow, we can see that she inherently regrets her decisions throughout her life. Were she to leave with the boy in "Sleep on the Floor," she would spend the rest of her life with him without regretting her marriage in "Angela." And if she were to stay with the husband, she wouldn't feel upset about her son coming from a broken family in "Cleopatra." You know the saying "live life without regrets"? Instead of taking the cliche route and blatantly stating the fact, The Lumineers take on the incredible and impressive challenge of transforming that phrase through a series of thought-provoking and heartfelt music videos.